In case you haven't heard, my house has a lot of oak. It feels a lot less dated, and because I stained the oak instead of painting it, the grain still shows though. It really is quite pretty. So how did I do it? Here is a step by step tutorial in case you want to try it too: Step 1: Remove the Rails Remove the rails that are attached to the wall. There are little clips that screw into the underside of the stair rail that are held by two screws. Unscrew those and lift off the rail. In my case the hardware was all brass (of course) so I had to deal with that right away. Then tape off around the brackets that remain attached to the wall. Don't remove them since they should be screwed into a stud and you don't want to risk loosening them up when you take them down and put them back up. You can use painter's tape up around the bracket and then tape up paper, sheet plastic or a drop cloth a few feet around each bracket to prevent spraypaint from getting on anywhere else. 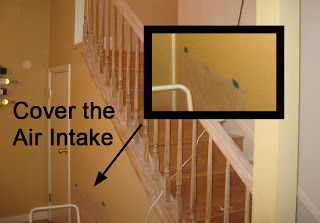 Also be sure to put a drop cloth on the floor below the area you are spraying to catch any falling paint spray. Repeat on all the brackets. Don't remove the paper or tape until the paint is completely dry, in order to avoid scratching the fresh paint. It is a good idea to do as much of your sanding outside if it is possible. 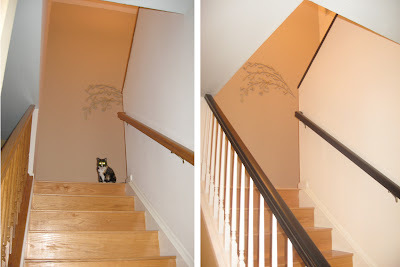 I was able to remove two rails from my stairs completely and I took those into my driveway and went after them with both my palm sander and by hand. The rail on the right has been sanded once with 60 grit sandpaper. You will notice that the sheen is gone and it will feel almost 'chalky' to the touch. It is now time to choose your finished look. I wanted a really really dark finish (like the inspiration photo) and I also wanted to mostly hide the grain. I decided on Minwax Ebony wood finish. 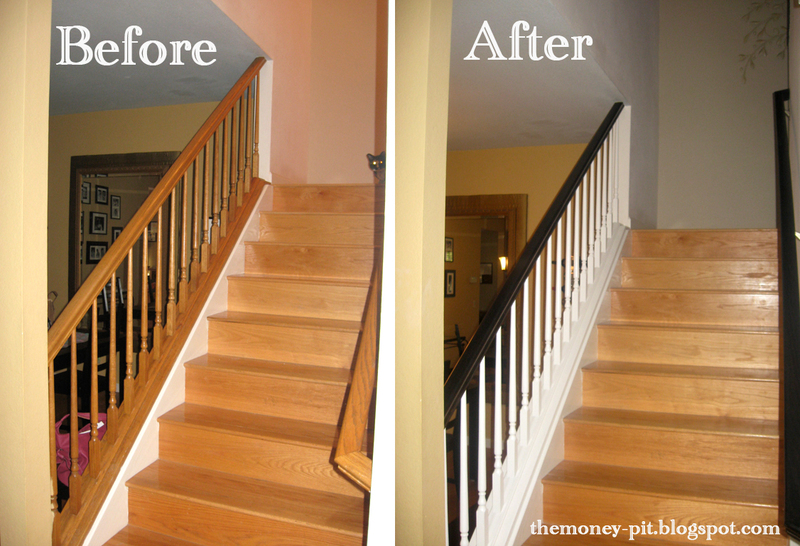 Remember when you are choosing your stain color to consider the type of wood you are staining. Most home improvement stores will have actual wood samples with the different colors to show you what your stain will look like on your wood type. To apply the stain you can either you a cloth (which is messy unless you are wearing gloves) or my tool of choice, a foam applicator. A nice thing about using the foam applicators is that they are inexpensive and can be thrown away after you are finished with the project. In between coats I store them in a ziplock bag and they stay wet so you can reuse them for additional coats, but at the end of the project, instead of cleaning them up with mineral spirits (since the stain is oil based you cannot wash them in water), I throw they away. I actually use two applicators, one to wipe on the stain pretty heavily, and one to wipe it off. With the stain I was using, I found it worked best to apply the stain pretty heavily, wait about 10 minutes until it was a just starting to get to sticky and then use a second applicator to wipe off any areas that were drippy or too heavy. Per the manufacturer's instructions I never allowed any excess stain to sit on the wood. Always remember to wipe with the grain of the wood and from the darkest areas towards the lightest. If you notice that your stain is raising the grain of your wood, you also may want to sand it in between coats. I didn't have a huge problem with the grain, so a quick once-over with the sandpaper is all that I needed. I did however need to do three coats of stain to get the dark color I wanted. In order to protect the wood from the dirt and oil in everyone's hands, you want to coat the stained surface with polyurethane or some version of it. I settled on PolyAcrylic (which shouldn't be used if you are using a Red Mahogany stain, but is fine with the rest of the colors.) If you are using a light color you should avoid oil based top coats since they tend to yellow over time and will distort the color of your rails. You need to wait 8 hours before applying an oil based finish and 24 if you are using PolyAcrylic. Can it be? Is that beautiful oak? Once your poly is dry you can remove the painters tape and prime your rails. You should tape off any areas where the wood to be painted touches another surface (such as the wall or your beautifully newly stained rail.) Normally I would say if you have a steady hand you could just freehand along the edge of the wood the but because you are going to need so many coats here, it actually will save you time to do the taping. After two coats of primer: looking good! It is time for paint. 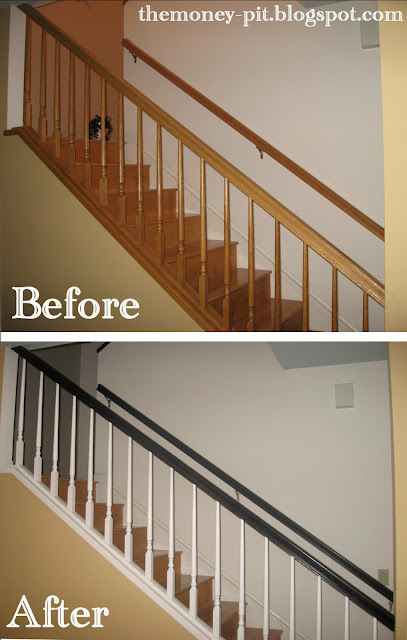 You would typically match you balusters and molding with the rest of the molding on your stairs, which is exactly what I did. I also used this chance to touch up any scuffs and marks on the rest of the stair trim. 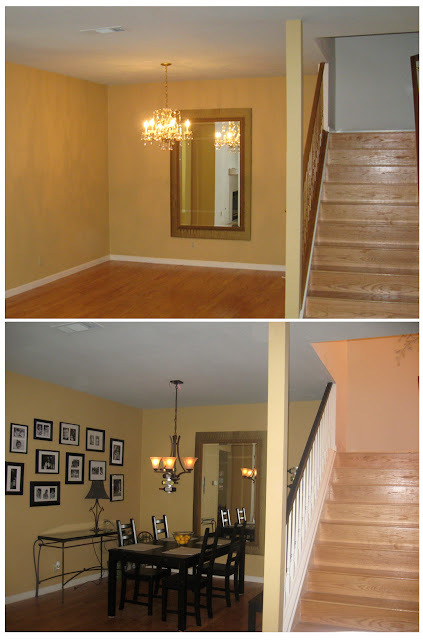 Depending on your paint color, you will probably need two coats to get the best finish. Step 8: Touch up Finally! The last step. At this point there is probably going to be a few drips, splats or smears of stain, paint or primer on some of your walls. Make sure you touch up those spots if you want to give this project a professional finished look. Because the stain color I chose was so dark, I actually had to touch up my mistakes with primer first and then paint over the primer with the wall color. And there you have it! For me, this project only cost me $4.79, the cost of a can of stain. The spraypaint, sandpaper, primer, paint and painting supplies I already had on hand. That is a great deal since I think it looks like a million bucks! Kim, this is beautiful. As always, I am so inspired by your use of mainly elbow grease and patience to update your house. I have been working on similar projects at home at night and on weekends! It looks great! I love the way it works with your furniture. Looks awesome. I would paint your yellow pole at the bottom of the stairs a white and trim it out to look custom. 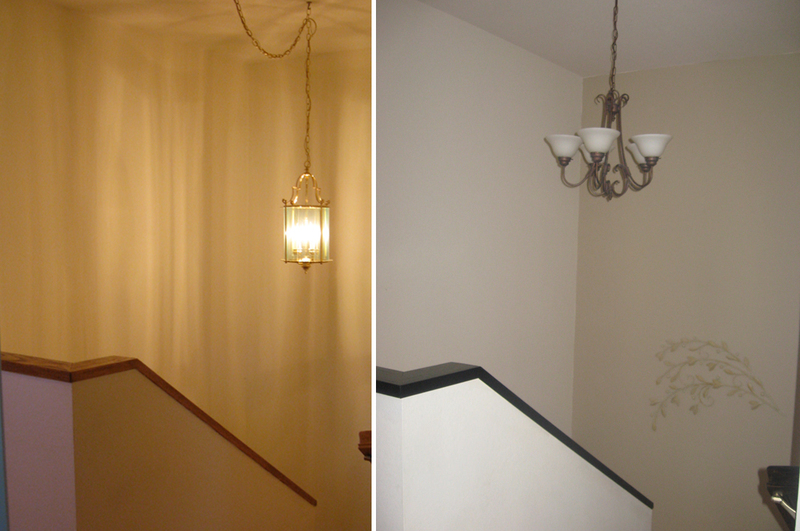 :) Also paint the back boards of the stairs white too. Love what you've done with the staircase-following you from TDC-stop by for a visit! Just found this via HomeTalk and I have to say, you are my hero! 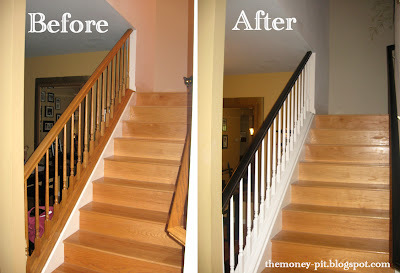 I have *lots* of oak too and am dying to do this very thing to my staircase. Well done! This looks excellent!! 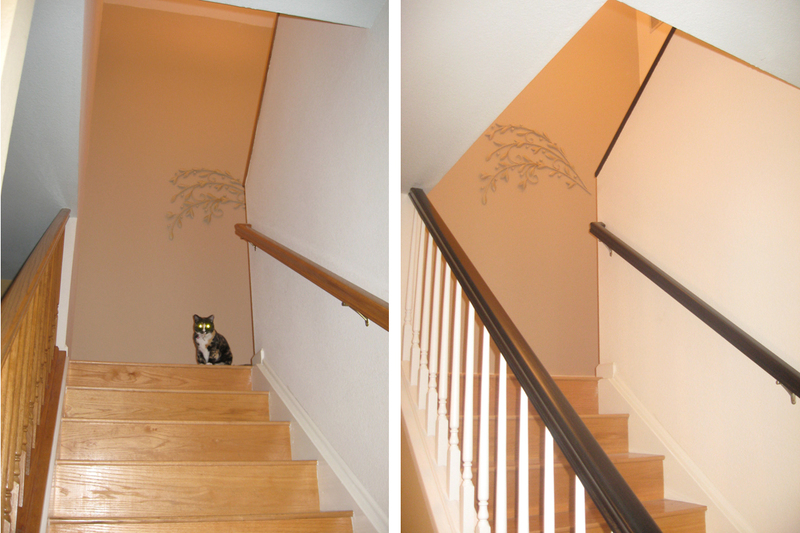 My staircase looks like the before picture. I may also try staining the tops of each stair and painting the vertical portion between stairs white!! Can you tell me what the paint brand/color is in your dining room? I've been looking for a color just like that! Thanks!